This is again going to be a story that will mean little to nothing to people with a different age and nationality than mine. It is about an fictive character that I first saw on television, and later showed up in comics and on records. 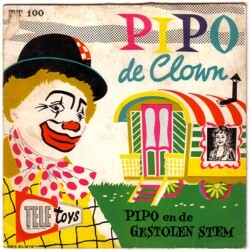 His name is Pipo de Clown and he was the creation of Wim Meuldijk. Although Pipo is a clown, I cannot remember having laughed once while watching his television shows or listening to his records. The series and all its off spins have a typical, but hard to define, B-quality. 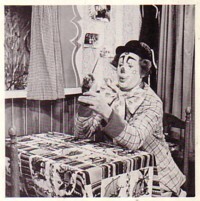 The actor( or actually one of the actors, because there were more than one), who played the role of Pipo the Clown ( Cor Witsche ), told in an interview that on the height of his popularity he was doing a show somewhere for a large crowd. The famous Russian clown Popov was also in the neighbourhood and for reasons I cannot remember they were on the same stage together for a moment. Cor Witsche told how embarrassing it was that the crowd only had eye for him. Nobody had any interest at all in Popov. “And I was not even a clown”, said Cor Witsche, “I was only an actor”. 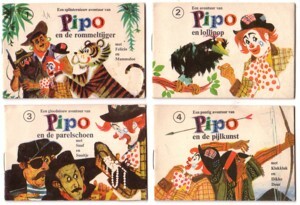 The popularity of Pipo de Clown (and of all B-art in general) fascinates me to no end. 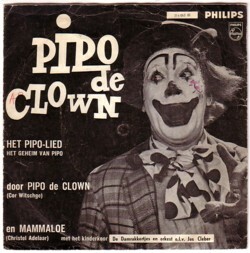 When my son was old enough to go through my record collection, he saw the Pipo de Clown records and insisted on listening to them. ”But that is boring and stupid, I have much better stuff!” But I could not talk it out of his head and to my amazement he has listened to all of my Pipo records. I tried to hide from him that there were also Pipo video’s, but once he found that out, they had to be viewed too. I could not imagine that I liked to watch this too when i was a child. Bad actors, no scenario’s, no action, no jokes! Apart from a Pipo de Clown record collection, I have also many Pipo de Clown trivia. I cannot say that I like this stuff, but it fascinates me. 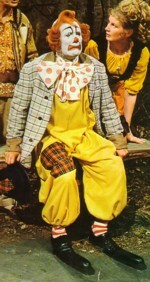 There is something about Pipo de Clown that I cannot resist. And I am not the only one: many people my age suffer the same syndrome. It took me several meditation sessions to find out what caused the spell that Pipo de Clown casts on me. But not so long ago i found out what it was. As with all true revelations my first reaction was “how could I ever have overlooked that? !” The magical attraction of Pipo is in the tune! The tune is magic! All the other Pipo productions are nothing but echoes of the tune. Unfortunately the magical effect of the tune is only on people my age, born in Holland. I do not always mention the people behind the music, but in this case, before I get questions about it, I will: the text is written by Wim Meuldijk himself, the music by Joop Reynolds and Pipo is Cor Witsche. Don’t forget that a lot of young boys (like me) and their dads had fantasies about mamalou. Wow Does this ever bring back my childhood memories. I am 52 and have lived in australia for the last 41 years but having done a search online for Suske an Wuske i recalled watching many episodes of Pipo the clown on tv and the radio and here i am. Pipo de Clown for president!